A slew of emerging technologies is shaping our lives, arguably at a rate of change never seen before in history. Enabled by cheap computing power and access to large data sets, machines are already doing a better job than humans in several areas. This ‘intelligence’ is moving away from central server farms into devices and things that will soon become part of our daily lives. These devices will potentially negotiate their own way in our world via ‘smart contracts’ and without significant human intervention. While there is significant ground to cover, India is promisingly poised to take advantage of this gathering storm of opportunity. As these technologies move out of the research labs and innovation hubs in Silicon Valley towards real-world implementation, India offers an opportunity to implement at a scale that is probably matched only by China, according to an exclusive EY-Mint Emerging Technologies Report that was released during the Mint Digital Innovation Summit on 15 March in Bengaluru. As India goes digital, data sets about various facets of Indian consumers and businesses are becoming available to fuel improved implementation. Our ecosystem of startups willing to plunge headfirst into the race to apply these technologies and data sets to solve unique Indian problems including agriculture, urban transport, energy management, financial inclusion, small format retail to name only a few. Last, but not the least, the government is taking several steps to spur the adoption of emerging technologies. However, there is a lot more to be done. To be able to compete with the US and China, India will need to invest significantly more to create a conducive environment to foster innovation and attract talent, as this report indicates. The dialogue is not just about survival, but the willingness to fight and thrive to stay ahead of the curve. The question is: Are you ready? It is catalysing transformation in every industry—helping companies transform the customer experience, launch digital products and services, and optimize supply chains. We see significant investment from big tech firms focused on horizontal AI platforms and start-ups focused on niche domain solutions. A critical constraint is the availability of large sets of good quality data that can be used to learn AI algorithms. While ‘point AI solutions’ are flourishing, we see a clear trend towards enterprises adopting a ‘general AI’ approach that unifies their efforts across their business functions. As China and the US fight for AI supremacy, India has the potential to become an AI powerhouse given the large talent base and access to consumers willing to try new AI enabled products and services. As billions of devices, services and systems get connected, we see consumers benefiting from improved lifestyle use cases and companies becoming more efficient as they minimize operational costs and increase asset utilization.A key enabler will be the advent of 5G technology that will improve the performance and security of IoT platforms. 3D printing is moving to industrial scale in a number of industries such as aerospace and defence, automobile, medical and engineering. It has the potential to shrink and disrupt existing supply chains and logistics. However, costly equipment, lack of talent and absence of standards and intellectual property (IP) safeguards are some factors that are restricting organisations to go full throttle with this technology. As and when the volumes grow, adoption in emerging markets will increase significantly over the next 3-5 years. RPA is changing the world of operations across multiple industries. If applied to the right operational tasks, RPA can provide significant efficiency thereby bringing cost savings. It is picking up traction in areas such as finance back-office operations, supply chain management, accounting and customer service in repetitive tasks such as data entry and purchase order issuing among others. Some of the cognitive technologies such as optical character recognition (OCR), natural language processing (NLP) and natural language generation (NLG) are taking RPA to the next level. 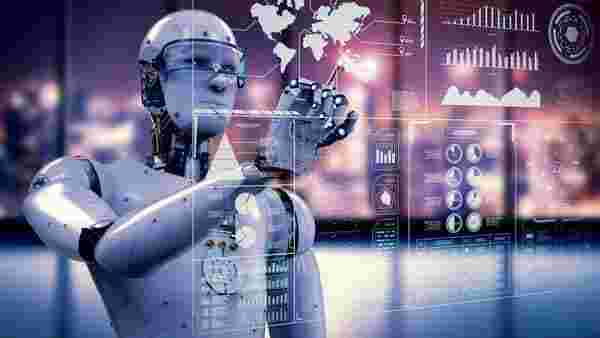 Rapid advancements in AI and machine learning, supported by increased computing power, have enhanced the sophistication of robots, which continue to replace redundant and hazardous work activities once performed by humans. We see industrial robots playing a pivotal role in the rise of Industry 4.0 and countries with declining or ageing population, such as Korea, Singapore, Japan, Sweden, and Germany will be the front-runners in industrial robots adoption. Industrial robot sales in India also has rocketed and is expected to continue its momentum, driven by use cases across logistics, agriculture and manufacturing. Blockchain is seeing significant investment across a range of industries. We see successful use cases where the trust paradigm needs to be decentralized (via the elimination of a central counterparty), large ecosystems need to be integrated and automation is critical. Governments across the world are leading the way and in some cases are mandating the use of this technology as they build next-generation citizen services and infrastructure platforms. However, on-boarding all players in an ecosystem is not easy and several critical technical issues including scalability will need to be addressed for this technology to achieve mainstream adoption. VR (immersive computer-generated world) and AR (overlaying virtual environment onto the real-world) have been touted as technologies that will transform how we interact with the world, but their adoption across enterprises has been underwhelming. In the coming years, we expect the adoption of AR-VR in enterprises to grow rapidly, especially across use cases related to advertising, retail, healthcare and education and training. The AR-VR market in India is still in its infancy but is expected to grow due to positive impetus from the government, industry bodies and investors.